OCI’s success has always been about our people. Experienced management, efficient production, successful financing, effective distribution, quality real estate – these are all just other names for talented people. Chairman & CEO, Oppenheimer Companies, Inc. 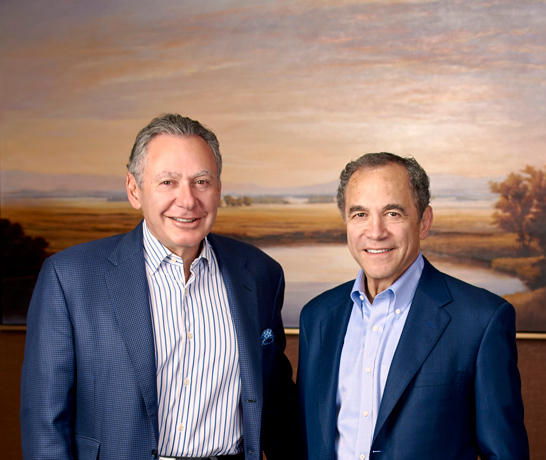 Skip Oppenheimer is currently Chairman & CEO of Oppenheimer Companies, Inc., and President of Oppenheimer Development Corporation and Chairman of several affiliated corporations. Skip graduated from Harvard Graduate School of Business Administration with an MBA in 1972; the University of Idaho with a BA in history in 1968; and received a Degree Elementaire in 1967 from the Sorbonne, University of Paris, France. He resides in Boise with his wife Esther Brollier Oppenheimer, a licensed professional counselor and artist. They have two sons, Joshua, a graduate of College of Idaho and Lesley University, and an elementary school teacher in Boise, Idaho and Matthew, a graduate of Dartmouth College and Harvard Graduate School of Business Administration; CEO of Remitly, an international mobile/internet remittance startup. Skip also currently serves as Director of the Federal Reserve Bank San Francisco (Salt Lake Branch) and is a Member of Boy Scouts of America National Executive Board and Board Member of St. Lukes Hospital System, University of Washington Medicine, and founding Chair and Director of Idaho Business for Education. Doug Oppenheimer is President and co-owner of Oppenheimer Companies, Inc. He is also President of Interstate Food Processing Corporation, President of Interstate Food group, and President of Greenline Transportation, all affiliated companies of OCI. Doug currently serves as President of Boy Scouts of America – Ore-Ida Council, Director of Idaho Community Foundation, Development Chair and Director of Idaho Business for Education, Director of the St. Luke’s Health Foundation, a Trustee of the College of Idaho, Andrus Center Board of Directors, and Director of the Idaho Shakespeare Festival Advisory Board. He resides in Boise and has five children – Sarah, Will, Tara, Andrew and Grace, and six grandchildren. CFO & Director, Oppenheimer Companies, Inc.
Larry Lipschultz is Chief Financial Officer and a Director of Oppenheimer Companies, Inc. (OCI) and the Vice President of Finance and Administration of Interstate Food Processing Corporation, an affiliate of OCI. Mr. Lipschultz joined Oppenheimer Companies, Inc. in 1990, following 15 years in various financial management positions with Unilever N.A., an international manufacturer of consumer food products. He graduated from Concordia University in St. Paul, Minnesota with a Bachelor of Arts degree in Business Administration and continued his graduate studies at the University of Minnesota. Mr. Lipschultz has been involved with many civic organizations in volunteer and board of director positions. He is a past Chair and Commissioner of the Board of Commissioners of the Meridian Development Corporation, an urban renewal agency, and currently serves on the Board of Big Brothers Big Sisters of Southwest Idaho. Controller & Treasurer, Oppenheimer Companies, Inc.
Shelli Norman is the Controller & Treasurer at Oppenheimer Companies and has been a member of the company since 1998. After graduating with a Marketing degree from Boise State University, she found her true calling in accounting. In her role with Oppenheimer Companies, she is responsible for the reporting on the financial performance of the company using best practices. She has served in various capacities within the corporate accounting department at Oppenheimer Companies up to her current role as Controller & Treasurer. Shelli is a native Idahoan, having grown up in the small town of Shoshone in the Magic Valley. In her spare time, she enjoys traveling with her husband, Paul, reading, playing rec league volleyball, and golfing. She is also an avid sports fan, and especially enjoys watching Boise State sports and NFL football. Dave Myers joined Golbon in June 2014 as the Director of Member Development for the Northeast region. In January 2015 he was promoted to Vice President, and in May 2017 to Executive Vice President. Dave assumed the position of Golbon President in February 2019. Prior to joining Golbon, Dave was the C.O.O of a broadline foodservice distributor in New England and was a Golbon distributor customer for several years. Dave also has several years of experience in retail marketing and category management consulting. Dave graduated from Lafayette College with a degree in Industrial and Organizational Psychology, is the proud father of four children, and relocated to Boise, ID from the seacoast area of New Hampshire. In 1974 Mike Amos graduated from Cal Poly, San Luis Obispo, with a degree in Business Administration and a focus in Marketing. He then entered the food business in California with Continental Processors, the Retail Store Brand Division of Continental Companies. In his 15 years with Continental Processors he grew into the position of VP, General Manager. After a short time in the retail vegetable business he joined Oppenheimer Companies in 1991 as Vice President of Retail Sales for Interstate Food Processing Corporation. Mike was a part of the Interstate search team which resulted in the Peak Foods LLC partnership with Lakeside Foods. Mike has been a key part of the whipped topping sales effort with Peak since its inception in 1999. Mike and his wife Janet of 43 years have two boys and three granddaughters who all live nearby and enjoy the outdoors of Idaho together. Doug Sumpter is a food distribution executive with over 40 years in the industry. His foundation started with Albertsons in 1970 where he spent the first seven years working his way through school. After graduating from Boise State University with a B.S in Business Administration in 1977 he worked his way up through store operations and then various senior marketing and operational positions at Albertsons. He relocated his family four times for Albertsons across the west coast. In 1990 he was appointed as the Vice President of Operations for Finast and Edwards Super Food Stores an Ahold company in New England where he was responsible for all store operations for 350 stores and was a member of the ABS real estate development group. In 1994 he became the President of Sentry/SuperSaver foods in Wisconsin which was an 800 million per year retail chain owned by Fleming companies. His team pioneered data based marketing for Fleming and were one of the first grocery retailers to develop branded food court concepts. Doug was also responsible for all store format development, real estate site selection and execution for all new store and remodel projects for this division of the company. In 1999 Doug and his family moved back to their home town of Boise Idaho where he started working as an independent contractor primarily in the wholesale and retail natural food channel. Doug joined Oppenheimer Companies in 2007 working with the Peak Foods Division in Sales and Marketing of the truwhip brand at retail and overseeing the industrial channel. He and his Wife Pam have two daughters and four grandchildren all living in the Treasure Valley. Chad Berry joined Oppenheimer Companies in February 2015 as General Sales Manager for the Interstate Food Group division. In 1998 Chad graduated from Cal Poly San Luis Obispo with a Bachelor of Science degree in Agricultural Business. He went to work in fresh produce sales in the Los Angeles area for the next 5 years before venturing into the restaurant business in Mammoth Lakes, CA. In 2006, Chad sold his restaurant and after spending 3 months hiking and fly fishing the Eastern Sierra Nevada’s, he made his way to Boise Idaho where he went to work for Treasure Valley Business Group as National Sales Manager for their foodservice division and later W.H. Moseley Company as Vice President. He married his wife Crystal in 2013 and in 2014 they welcomed their first son Denlan and, 22 months later their second son Bradock. Chad enjoys being a father, spending time with family and friends, cooking, snow skiing, fishing, playing soccer and traveling near and far. General Manager of Logistics, Oppenheimer Companies, Inc.
Curt Sukeena has been with Oppenheimer Companies, Inc. for over twenty years. He is the General Manager of Logistics for the company. After attending Penn State, and obtaining his degree in Personnel Administration he spent ten years on active duty with the United State Air Force working as a Personnel Utilization Manager. His service included a number of duty assignments culminating in a three year tour of duty at Sembach Air Base, Germany. After his honorable discharge and prior to coming to work at Oppenheimer Companies he was the Operations Manager for a large Idaho based trucking company where he managed the refrigerated freight division. He currently manages the OCI logistics division which handles the transportation needs for three major internal companies including Interstate Food group, Peak Foods, Golbon and also a third party brokerage division known as Greenline Logistics. Curt has been involved in youth baseball for many years including being past President of the Nampa, Idaho American Legion Baseball Program and Senior Board member for the Babe Ruth Program. Curt has been married to his wife Vicki for over 31 years and they have two grown sons and one granddaughter. Jeremy Malone, RPA is a Boise native having attended Boise schools and Boise State University. In 2007 Mr. Malone attained his Real Property Administrator (RPA) designation from Building Owners & Managers Institute (BOMI) International and additionally received his Construction Management Certificate from Boise State University in 2010. He has been with Oppenheimer Development Corporation since 1991 serving in various capacities to his current role as Vice President. Mr. Malone is active in the Boise community, both professionally and personally. He either is currently serving on or has served on numerous Board of Directors including the Boise Metro Chamber of Commerce, Downtown Boise Association, BOMA Boise, BOMA International, American Heart Association, Urban Land Institute – Idaho, Together Treasure Valley and University of Idaho College of Art & Architecture, in addition to serving on various committees for Capital City Development Corporation (CCDC), City of Boise and Downtown Boise Association. He is also involved in Boise’s Basque community being a past president and Board of Director of the Boise Basque Center, co-chairman of Jaialdi 2015 and a board member of Jaialdi 2000, 2005 and 2010, an international Basque cultural festival held every five years in Boise. He was also an elected delegate to the North American Basque Organization. Mr. Malone danced with the Oinkari Basque Dancers, a Basque dance troupe who have performed nationally and internationally, and was an instructor for Boise’ko Gazteak, a youth Basque dance group for children ages 4-13. Additionally, he has coached numerous of his son’s teams including baseball, basketball, football and soccer. In his free time, he enjoys playing golf, tennis, riding bicycles and spending time with family and friends.